I love discovering new brands, and browsing around Liberty a good few weeks ago, I was intrigued by Votary Cleansing Oil. From the colour of the bottle – a pleasing bright green, that stands out so beautifully from the white and pastels of many other skincare brands – the gorgeous rose-gold label, Votary looks different to many other skincare brands, and it has a slightly different ethos too. ‘You’ve been told that clean skin should feel stretched and tight. Skin should not feel taut, or squeaky after cleansing. Ever. It’s a hard habit to break though, and initial trials of oil-based cleansing are often abandoned by people who claim that their skin feels “coated” or “unclean” afterwards, when in fact they’re actually so used to having their skin stripped and dehydrated by (usually) foaming cleansers, that they no longer know what healthy and hydrated skin really feels like! I spent years thinking my skin was both dry and acne-prone when in fact what was happening was that I was stripping my skin so much that it was flaking off because the foaming cleansers I favoured were just removing the oils my skin needed, and spots were just being caused by the inflammation caused by the harsh chemicals. Discovering oil cleansers – my first was Origins Liquid Crystal, long discontinued now, but held in high esteem here, even now – was the saviour of my skin. So I am delighted to have Votary in my rotation now. It’s a slightly viscous oil that spreads easily over the skin, and is particularly suited to massage. It smells delightful (lovely when you have a hot flannel over your face, and are inhaling the steam before you start to remove it), and has an exceptionally short ingredient list; Sunflower, Apricot, Jojoba, Grape Seed, Rose Geranium, and Chamomile oil, essentially. It does remove makeup, but I like it as a second cleanse for it’s nourishing and massage-worthy qualities. One thing you do need to know about the formula is that it absolutely, postively, totally does not emulsify, and so can only really be properly removed with a cloth. 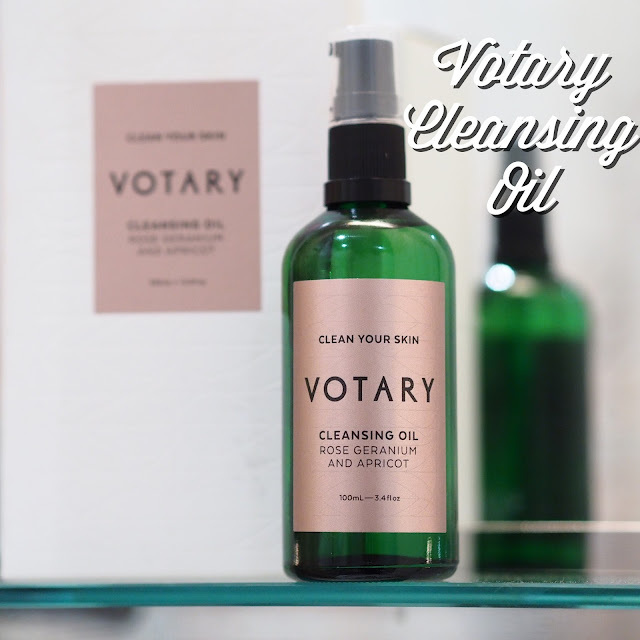 Luckily, Votary Cleansing Oil provides a generously sized and luxurious cloth in the box. It costs £45, which I’m aware is a high price, but with such a clean ingredient list, it’s not really a surprise that it’s on the expensive side. The bottle is a generous one, and you don’t need much to cleanse your whole face and neck – I’ve been using mine 5-6 times a week (mostly as a night cleanse, which is why you don’t see it so much on my weekly skincare posts – I’m too lazy to document my skincare twice a day) and I’ve probably used about an eighth of the bottle so far, if that, so it lasts and lasts. I think I’ve probably got at least another 5 months or so usage in there, anyway. An investment purchase then. But if you don’t invest in your skin, no one else will. You can find Votary in Liberty Beauty Hall, or at their online shop. If you care about your skin, Votary will care for your skin. The Fine Print: Personal purchase.